Hours: Tue-Sun, 6 a.m. to 9 p.m. Although Smiley’s has been around for only 8 years, they are proud to cook their ‘cue in the traditional way on a wood pit, an art that is starting to disappear even in tradition-bound Lexington. On their website, the folks at Smiley’s say, “Pit Cooked BBQ is different from the electric or gas cooked BBQ processes that are commonly seen in today’s marketplace. With Pit Cooked BBQ, you can taste the rich flavor of the open flame in every bite.” Ain’t that the truth! Smiley’s serves up a quality product cooked with care. Their hard work pays off with tender, moist ‘cue that holds up well against many of Lexington’s best (and better known) barbecue joints. 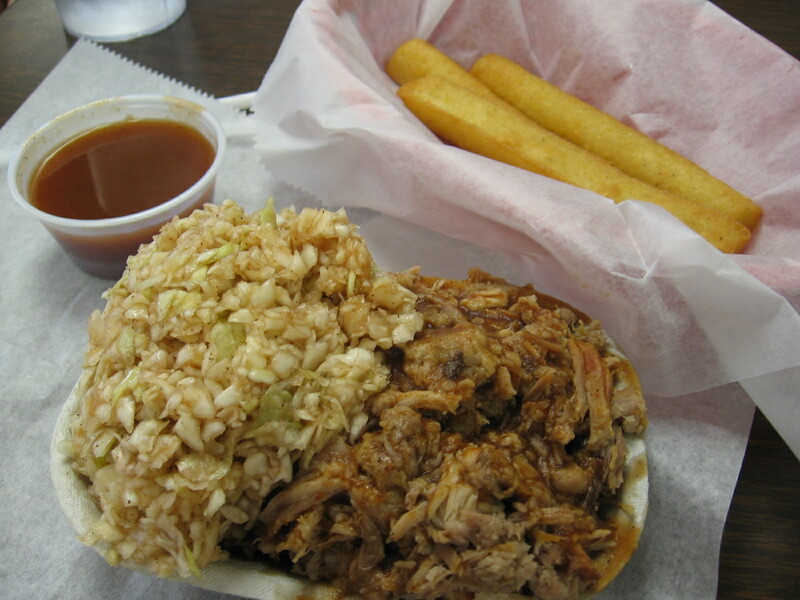 Smiley’s is a fairly typical Lexington-style joint, cooking pork shoulders that are available chopped, coarse-chopped or sliced. The chopped is an excellent, medium-rough consistency that is not as finely chopped as some joints’, a trait characteristic of places like Smiley’s that continue to hand chop their ‘cue instead of using a machine grinder. The meat is served with a ketchup-spiked vinegar dip on the side. Smiley’s red/barbecue slaw is a good specimen of what Lexington-style slaw tastes like, love it or hate (I am a fan but understand why some have a hard time making the leap from creamy mayo-based slaw to the mayo-less cabbage/dip concoction). Although hush puppies and rolls were an option, as in most Lexington-style joints, I ordered my meal with corn sticks, a rare treat in this part of state. 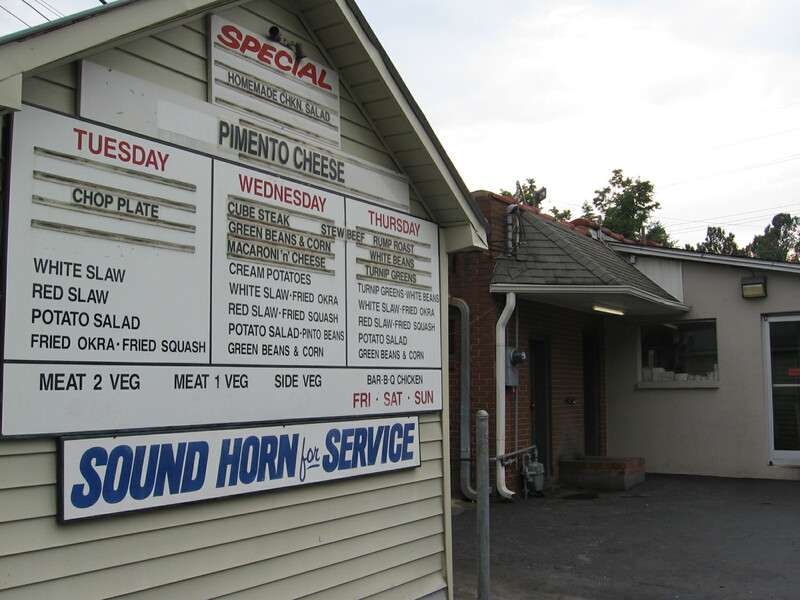 Curb service is offered, and those who partake can order the ‘cue or any of a number of other dishes from their full menu, which includes burgers, hot dogs, pimento cheese sandwiches, and bologna sandwiches among other grill favorites. BBQ chicken is served on weekends only. Judging from the fairly thin crowd when I visited, compared to the busy scene at the good-but-inferior Speedy’s just two blocks away, Smiley’s is a bit underappreciated even by the locals. I suggest you pay them a visit and make them feel appreciated for all their hard work. I think the good food and friendly service will make you feel appreciated too. I have tried Smiley’s and found the chopped Q quite good. A big bonus is that it is open on Sundays. My friend got the sliced BBQ and it looked excellent. I will try it the next time I go. I wasn’t too impressed with Smiley’s, as my chopped Q had too much outside brown (meat-skin) chopped in and it tasted a bit burnt. I was MUCH more impressed with “The Barbecue Center”!!! If you haven’t tried that one yet, I’d definitely recommend it!!! Another_Q, your distaste for “too much” outside brown probably explains our difference of opinion. I don’t think I’ve ever encountered a BBQ meal with too much brown for my taste buds! I have been to the Barbecue Center and agree it’s very good. Porky… based on your excellent review of Smiley’s… the fact that it was Sunday and most all “Q” joints are closed… and the fact that I was having some serious “Q” withdrawal… I decided to take that short 25 mile excursion to Lexington. Brother, you were spot on!!!! It was worth the trip. After choosing a table, we were promptly greeted by an extremely courteous and attentive waitress. I informed her that this was my first visit there and she brought us up to speed on the menu items. I had the chopped plated and the bride had barbecued chicken. The “Q” was generous, not too finely chopped and had an excellent smoky flavor with some OSB (that’s “outside brown” for you rookies) chopped in. Like you, I love OSB in my “Q”. I requested some warm dip on the side which the waitress promptly brought me. The barbecue slaw was a tasty compliment and a little coarser chopped than other places. Unfortunately, I couldn’t get too excited about the fries. They were your typical frozen crinkled kind that are kinda okay. Well, at least they did cook them crispy at my request. Why can’t these barbecue restaurants make their own fries??? The bread sticks and hush puppies were very good. The sweet tea was delicious but like most Lexington joints… they don’t give you a real lemon slice with it. I like lemon in my tea but I can’t stand those plastic Real Lemon squeeze thingies. My wife had the barbecue half-chicken. The dark meat was moist and tasty but the white meat tended to be a bit dry as it’s want to do when pit-cooked. She is a bit of a mac ‘n’ cheese snob, but she really liked Smiley’s style. All-in-all, a nice Sunday evening junket. Will definitely go back, but next time I’ll just stick with the “Q” tray… and maybe bring a lemon slice in a baggie. I’m glad you like it, Bob-B. I can tell you are a man that appreciates good ‘cue! Keep on posting and please do leave a comment in The Joints section if there are places I’ve yet to review that you think are worth a visit.